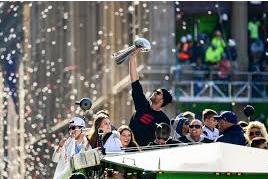 The drought is over, for the first time in over 95 days the City of Boston will be hosting yet another victory parade, this time for the now SIX TIME Super Bowl champion, New England Patriots. Just two days after winning Super Bowl LIII, the Patriots will fire up the duck boats and will show off the new Lombardi trophy and celebrate a season that showed adversity, mental toughness and most importantly success. An estimated 1.5 million people attended the parade to cheer on the team, the most of any Patriots parade, and only 12 were arrested. Although there was an absurd amount of people at the parade there could’ve been more. The main majority of people who were at the parade took the train in from wherever they lived. Because of that, many of the trains were full and many people were turned away from the trains and couldn’t go. There were some people who got very lucky and had a spot to park near the parade. “I was lucky, my boyfriends dad drove us into Boston and we parked at his friends apartment which was two blocks away from the parade so we were in and out by 1,” says sophomore Lina Joy. The parade started at the Hynes Convention Center on Boylston Street, continued on past the Public Garden and Boston Common, and made a turn onto Tremont Street to Cambridge Street before ending at City Hall. For many people, they had to wait a long time considering how early they got there. “We got there at around 9:30 but we were set up at the end of the route. It wasn’t until around 12:15 we saw the team, but overall it was a lot of fun,” junior Taylor Kim says. As for the people who got there, you can bet everybody was having the time of their lives. “A lot of people think that it gets boring having all of the parades but coming from a die hard Boston fan, it gets better every single time,” says sophomore Daniel Fishman. There were many highlights from Tuesdays eventful parade such as the players catching beverages from fans, dancing and shirtless 300 pound men. “My favorite part was when David Andrews took off his shirt like he had the body of Gronk,” says sophomore Cole King. Others just loved seeing the players. “Seeing all of the players was just so cool because i’ve never been to a game, seeing Gronk raising his hands and pointing to the fans was really cool, i’m happy I caught a video of that, those memories i’ll have for the rest of my life,” adds sophomore Lina Joy. For a lot of people, the parade was when it actually hit them that the Patriots actually won the Super Bowl as SB53 was extremely uneventful and very anti climatic. “It hit me when I saw Coach Belichick holding the trophy and I started having these emotions that I usually get after the Patriots win at the last second,” says junior Jake Geisinger.